TALLADEGA, Ala. – With construction efforts continuing around the clock on the concrete tunnel slab for Talladega Superspeedway’s new Turn 3 Oversized Vehicle Tunnel, here are some cool, interesting facts on the initial endeavor of Transformation – The Talladega Superspeedway Infield Project. 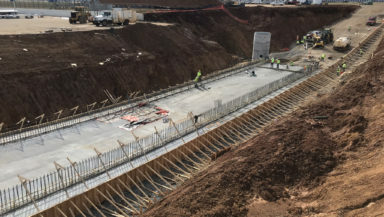 Cover a Football Field: Once the tunnel is finished, enough sheet waterproofing will have been applied to the tunnel to cover an entire football field from end zone to end zone. Work has also begun on the foundation walls and will continue through December. After the flooring and walls are set, precast concrete tunnel arch sections are scheduled to be applied in early January to create the top of the tunnel. Oxford, AL’s Taylor Corporation is spearheading the tunnel construction effort. The Oversized Vehicle Tunnel, which is scheduled for completion in time for the track’s April 26-28, 2019 spring motorsports tripleheader weekend featuring the GEICO 500, is the initial part of the approximately $50 million Transformation Infield Project that is part of International Speedway Corporation’s (Talladega’s parent company) long-term capital allocation plan and reinvestment into its major motorsports complexes. The new two-lane tunnel will be capable of allowing vehicles as large as race team haulers, fans’ recreational vehicles as well as track tram vehicles (to take fans who have both infield admission and grandstand seating) to enter and exit the track simultaneously with ease. It will be open 24 hours during event weekends. Also slated to be ready for spring 2019 is the 67-spot Finish Line Premium RV area (located just past the start-finish line & includes full hookups), as well as new Infield Shower Trailers. The culmination of Transformation will occur in October 2019 and will allow fans to be immersed into the sport of NASCAR with a one-of-a-kind Garage Fan Zone Experience, which will feature “up-close” access, interactive attractions and enhanced amenities for fans, sponsors, teams and stakeholders in the iconic Talladega infield. In addition to the GEICO 500 on Sunday, April 28, Talladega Superspeedway’s springtime weekend will consist of the Talladega 300 for the NASCAR Xfinity Series on Saturday, April 27, and the General Tire 200 for the ARCA Racing Series on Friday, April 26. For ticket information, call 855-518-RACE (7223) or log on to www.talladegasuperspeedway.com. Talladega Superspeedway – which will celebrate its 50th anniversary season in 2019 – is the most competitive race track on the NASCAR schedule (record 88 lead changes in 188 laps), the highest-banked (33 degrees) and the longest (2.66 miles) as well as the most fun and fan-friendly. Talladega offers something for everyone, including hundreds of acres of free camping, amazing kids tickets and college student prices, along with special offers for military members, first responders, teachers and educators. The historic venue, which opened in 1969, is deemed NASCAR’s “Party Capital” thanks to the track’s infamous infield, the traditional Saturday Night Infield Concert presented by Wind Creek Casino and Hotel on event weekends and renowned Talladega Blvd., home of the “Big One on the Blvd.” party. It’s the site of the most comfortable seats in motorsports, large ISM Vision HD video boards lining the frontstretch and numerous pre-race activities for fans on race day, including special Kids VIP opportunities. For ticket information, visit www.talladegasuperspeedway.com or call 855-518-RACE (7223). The track, along with its parent company, International Speedway Corporation, announced earlier this year Transformation – The Talladega Superspeedway Infield Project. The approximate $50 million redevelopment endeavor is part of ISC’s long-term capital allocation plan and reinvestment into its major motorsports complexes. The project, highlighted by a one-of-a-kind Garage Fan Zone Experience, will feature “up-close” access, interactive attractions and enhanced amenities for fans, sponsors, teams and stakeholders in the iconic Talladega infield. Full completion of the modernized project is scheduled for October 2019. Fans can learn more about the project and view the progress 24/7 via the construction cam by visiting www.talladegasuperspeedway.com/transformation.